A long road trip is a serious test for your vehicle and even a seemingly minor problem, like a cracked windshield or out-of-balance wheel, can cause you a lot of trouble. You should be having your car inspected on a regular basis to make sure everything is properly functioning, but it is especially critical you have an inspection before a long road trip. We understand that many of you tend to your own car’s maintenance needs. If this is the case, you will need to make a list of what needs to be checked before your road trip. One of the first things you should do before a road trip is ensuring your windshield is free from cracks or any other damage. Even a very small crack could spread and cause problems while on your trip. 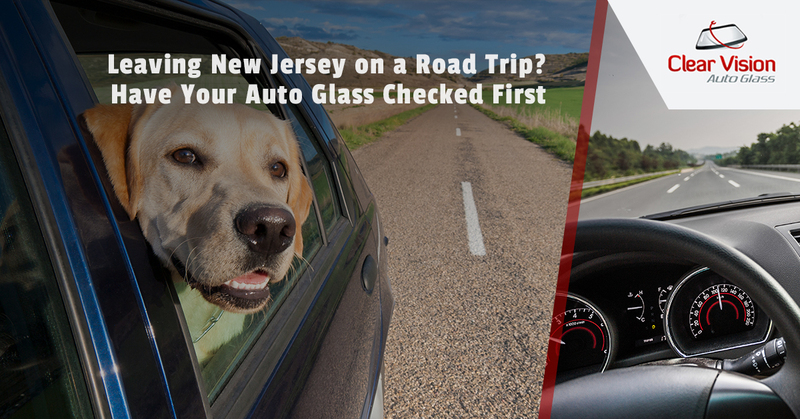 If there is a problem, set an appointment with Clear Vision Auto Glass, serving New Jersey, Delaware and Pennsylvania, right away. Fluids are the lifeblood of any car and need to be checked before taking off on a trip. There are six essential fluids you need to check. You don’t need to be a mechanic to know how critical oil is for an engine. Oil keeps all moving parts lubricated and moving smoothly without friction. Be sure to change your oil before a long trip and check the oil while on the trip to ensure proper levels. If you don’t already know this; when you press your brake pedal, it is the fluid that compresses inside the brake lines and slows your car. Brake fluid is important and needs to be checked before you leave on your road trip. Have your brakes checked out by a professional if you notice your brakes are spongy, have extra travel or are making noise. Your engine produces a lot of heat and it’s the fluids in the radiator that help keep it cool. If you take a trip while low on radiator fluid, you could suffer an overheated engine, which is no fun. Unless you are driving a very old car, it will be equipped with power steering and power steering fluid. Power steering makes turning a lot easier, but your steering will be less responsive if you are low on power steering fluid or if it is too dirty. Transmission fluid helps your car’s gears mesh smoothly. If you are low on transmission fluid, you could experience uncomfortable shifts and loss of power. There is no doubt about it, your windshield is sure to get dirty on a long road trip. There are any number of factors that cause a dirty windshield, like bug splatters and mud being slung by the cars in front of you, make sure you have plenty of wiper fluid to keep your windshield clean and your vision clear. Checking your car’s fluids before a long road trip lessens the chance you will wind up on the side of the road having to call AAA. If you are going on a road trip and have a cracked windshield, contact Clear Vision Auto Glass.